Regardless of how you feel about the Japanese brand, you have to admit: Mazda makes some damn fine concept sketches. Admittedly, the final products don’t always live up to the hype generated by the originally-released artwork. But, the mastery of fading color shades, lines of motion, and dynamic curves is practically worth hanging on the wall. Who wouldn’t want to buy a car that looks just like this? 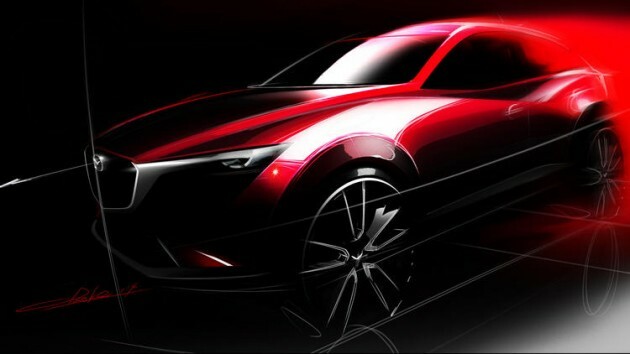 Will the Mazda CX-3 Design Sketch Be Better Than the Real Thing? If you’ve seen the Mazda CX-3 design sketch and are wondering when you’ll get to see the real thing, keep your eyes on the west coast from November 21st to November 30th. During this year’s Los Angeles Auto Show, Mazda plans to officially unveil its new compact crossover SUV. Like most of the vehicles being produced by Mazda these days, the new baby will feature SKYACTIV Technology and be based on the KODO Soul of Motion design. During the much-anticipated week in November, you’ll also see the newest Mazda MX-5 model, plus an updated Mazda6. So, the question still left is “Will the real thing be just as awesome as the sketch looks?” That has yet to be decided. With Mazda jumping into the compact crossover SUV pool with the likes Honda (with the HR-V) and Chevy (with the Trax), will the brand be able to stand against competitors who have become known for their family-oriented vehicles? Perhaps Mazda will bring a fresh and innovative perspective to the growing crossover segment–at least, that’s what the Mazda CX-3 design sketch promises. As the press days for the LA Auto Show occur a couple days before the event opens publicly, we’ll soon see if the CX-3 will stand in the limelight or be left standing in the shadows of its rivals.